It’s tragic every which way. Come chat about it here, at Let Grow. If You’re Bored or Busy, Do You HAVE to Play with Your Kids? Check out five minutes of Jeff Allen, riffing on his childhood and today’s. The video — and conversation about it — are over at Let Grow. How Did these Sisters, 8 and 5, Survive Almost 2 Days and Nights Alone in Cold Woods? Video and story are over at Let Grow, where we celebrate their (unintentional, of course) #LetGrowMoment! 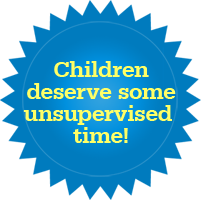 Kids Need and Deserve Unsupervised Time — Let’s Keep It Legal! Please share this minute-and-a-half video of Dr. Peter Gray’s testimony about what kids get when they have time AWAY FROM ADULTS. And why it must be legal for parents to take their eyes off them.